" Kombucha brewing starter kits for beginners that give you all the necessities in one simple package." " It’s at your local Whole Foods market, on tap at all the trendy coffee shops and restaurants, and it has even made an appearance on mommy blogs. Kombucha, the fermented tea drink, is being praised for its health benefits. It also tastes pretty good. This kit comes with everything you’ll need to make it at home. " " The still-hip drink is now easier than ever to make at home. This kit comes with a gallon jar, organic Rishi tea, organic sugar, the kombucha starter, and step-by-step instructions. All you need is a hipster friend who's really into the kombucha lifestyle." " For 2017’s Holiday Gift Guide, we wanted to do something different—still a curated list of high quality items that designers will love to give as well as add to their own wish list." " There's nothing better than a craft, especially if it's a craft you can drink [...] And since you'll have the raw materials to start a lifetime of kombucha brewing, you can stop shelling out $5 a bottle at the store. " " This kit comes with everything they need to make their own kombucha at home, including a SCOBY! The step-by-step guide will ensure their first brew comes out great. Plus, customers rave that their custom blend tea makes the best kombucha ever! " " Finding the perfect gift for everyone on your list is easier said than done [...] Do you get them a cookbook or an apron? If you want to avoid the phony smile that gifts like that bring, you need a collection of our favorite gifts that are as unique as your recipient [...] for the #HealthyEATERS - THE KOMBUCHA SHOP Kombucha Brewing Kit. " " Why you should try it: [...] the fizzy beverage is packed with vitamins, antioxidants and acids (most notably glucaric acid) which may improve digestion, as well as help prevent cancer and degenerative diseases. 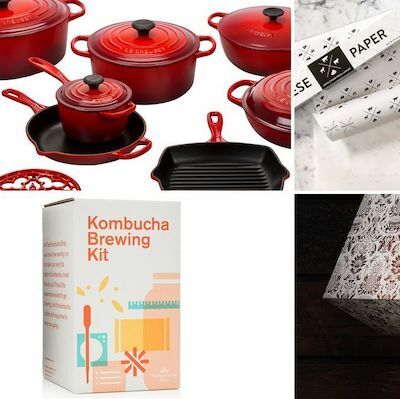 How to make it at home: If you’re just getting started, you can nab a starter kit online from places like The Kombucha Shop. " " Dive into Imbibe’s ultimate holiday drinks, gift & entertaining guide. Take a passion for kombucha to the next level with this homebrew starter kit from The Kombucha Shop. " " Wisconsin products can make perfect holiday gifts and will keep your dollars in the local economy and mornings warm. The Kombucha Brewing kit comes with everything you need to start making your own fermented tea at home, including jar, sugar, tea and cultures. " " It has everything you need to get started and they go the extra step to help you make a perfect batch, with their testing strips and thermometer. " " Because I was feeling overwhelmed with all of the supplies and research, I ordered this Kombucha Starter Kit from Amazon. I highly recommend it if you're not sure what items you need. " " One of my favorite discoveries of 2015 was learning how to make my own kombucha. This kit helps with that! It’s been about 6 months since I started my first batch and I’m still going strong. Spread the kombucha love and get your friends & family their own kits. " " Sum•mer buck•et list (noun): a list of things that a person would like to accomplish and experience during the summer months. " #1 on this blogger's list was to learn how to brew her own Kombucha. To get herself start she used the TKS Homebrew Kombucha kit.
" A couple months back, I met the fabulous Kate Tecku, owner of The Kombucha Shop. Her online store provides DIY kits for those of us who want to do a little science experiment in the kitchen. When you purchase the kit, you receive everything you need to brew your own kombucha at home, including beautifully designed instructions that give you step-by-step guidance so you can’t mess it up. " " This fermented tea with numerous health benefits is all the rage, so we were thrilled to find an all-in-one kit for making it at home. " " Once you try it and love it, gift it to a friend. This is the perfect gift for the DIYer who's health-conscious. " " The box came in the mail with complete easy-to-follow directions. I mean, every question I had was laid out there for me. It was a breeze! " " TKS [...] takes the work out of brewing and provide you with supplies and simple instructions on how to brew your ‘booch from start to finish. I was a total n00b and managed to turn out a great batch! " " Kombucha offers up an addictive, tangy fizz with a healthy dose of probiotics. Mix up a batch with this Home Brew Starter Kit. "